ELEVATED trains whizzing at tremendous speed from city to city, powered solely by electromagnetic lines of force, is the new and startling method of rapid transportation now being developed by German engineers. A war against friction losses has long been waged by scientists; and this electromagnetic rapid transit project now promises to end the conflict. 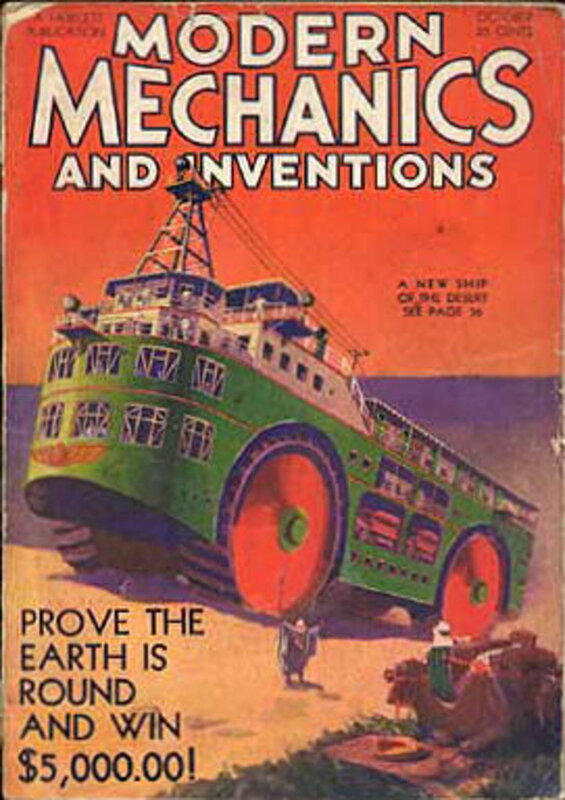 No wheels are to be used for traction. The cars are drawn forward, in one scheme by powerful electromagnets, in the other by huge solenoids. 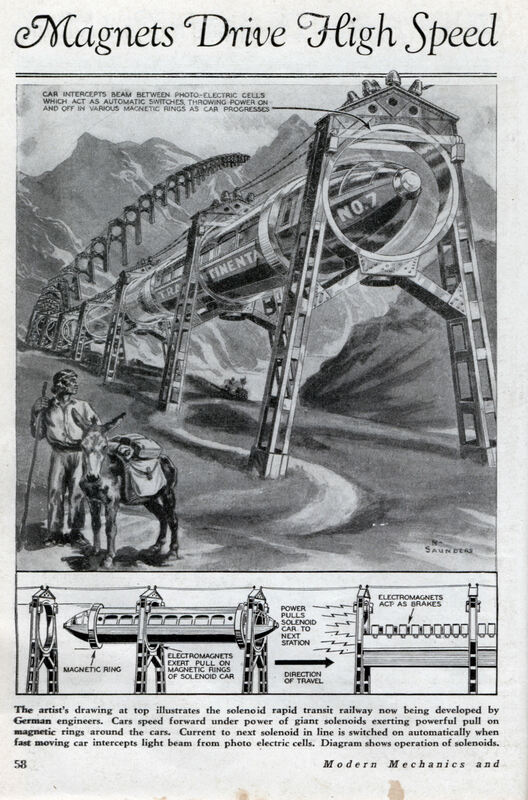 Cars on the solenoid railway are to be equipped with giant magnetic rings, as illustrated on the opposite page. Power is switched on to the solenoids automatically as the car progresses by means of photo-electric cells operating at moment beams are intercepted. Speed of the electromagnet cars is regulated at the central power station by a revolving switch which cuts the magnets in the circuit like electric lights in a display sign. Connections through wireless enables operator to give stop or start signals. This is a wonderful article. This is almost exactly the system described by Robert Heinlein in his book “Starman Jones”. He uses the term “Ringroad” to refer to such a system. I want my Maglev Trains! I want my personal flying car! I want my housecleaning robot! I want my personal submarine! I want my supersonic rocket transport! I want my round, solar-powered, pre-fab house on a mountain side somewhere! And I want it ALL NOW!! I want my wristwatch to start running again! I’d settle for just the ten-hour workweek! There’s something similar to this called the Wuppertal, though it doesn’t use magnets to move. Either way they were both way ahead of their time. I believe this is great for the well being of the world, it no fuel and is easy on the enviroment. If we could only have the knowlege to make some type of hovering craft that would do the same, it would be even greater. Maybe we could put very strong magnets on a car that would be strong enough to pull toward our Earths core but also push away at the same time to make it hover. Maybe it is possible.